Cloud computing is that an organization is making use of a scalable computer network or IT Infrastructure for IT Services via the internet. The software in a cloud is cloud-based software. A Business application provided via the cloud, this is called software as a service (SAAS). People just need to log in and they can work from anywhere and use any device: PC, Laptop, Tablet PC or Smartphone. User organizations and users have no software or hardware worries anymore. The advantage of a cloud is that as you as user of IT services do not have to care about IT Infrastructure matters. For instance, when a version of software changes or the network needs to be updated or extended. All that is taken care off by the cloud provider. Cloud computing is as safe as online banking. You can trust you data to the cloud. That is if you carefully select your cloud provider. A public cloud primarily is a cloud where users via the browser access one or more web applications that serve more than one organization. Also as an end-user organization, you are not responsible for managing the software or hardware of the cloud. A managed private cloud is a cloud where you first need to login to a remote client or virtual desktop, to get behind a firewall and then you login to a (web) application via the browser. As end user organization you are normally responsible for managing the software or hardware of the cloud. The Cloud provider is responsible for managing the software and hardware of the cloud. You are the owner of your data and can control how it is stored and archived. An on-premise private cloud is a cloud in the data center of the end user organization. It often resides on their intranet and the data is secure behind a firewall. As an end-user organization, you are responsible for managing the software or hardware of the cloud. Cloud Computing is a technology concept part of the Technology Reference Architecture of the Dragon1 EA Framework. 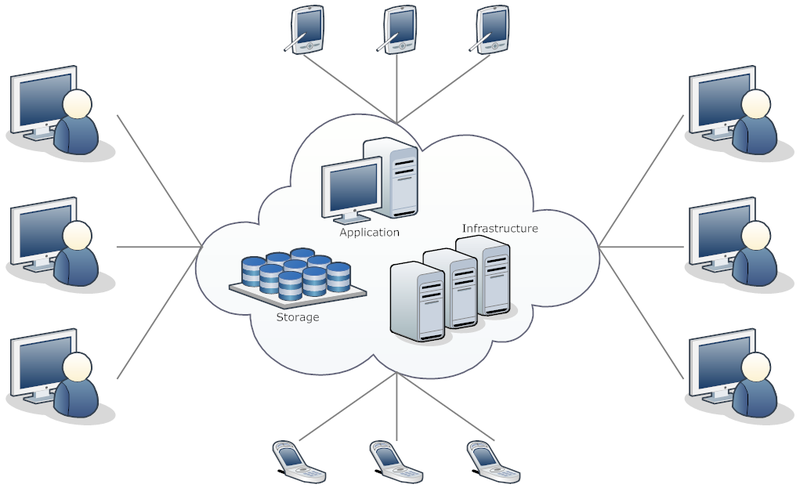 Cloud Computing is about creating a scalable computer network and networking resources over the internet. Go to Cloud Computing. This page will present a definition, literature references, a principle formulation and principles detail diagram.